You victoriously receive many prizes. 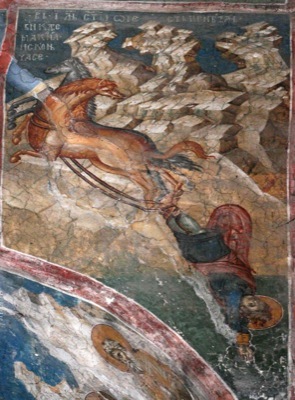 Orestes was from the town of Tyana in Cappadocia. He was a Christian from birth and a physician by profession. He was harshly tortured by a certain wicked eparch Maximus during the reign of Diocletian. When the eparch at first advised him to deny Christ and worship idols, Orestes replied: "If you knew the power of the Crucified One, you would reject idolatrous falsehoods and worship the true God." For this, he was savagely beaten, scraped, pulled apart on the rack, burned with a red-hot iron, and cast into prison to die of starvation. The young Orestes spent seven days without bread or water. On the eighth day, he was again brought before the eparch who threatened him with frightening tortures. Orestes answered: "I am prepared to endure every pain, having the sign of my Lord Jesus Christ inscribed on my heart." The governor condemned him, and the torturers hammered twenty iron nails into his feet and tied him to a horse, dragging him over thorns and rocks until the Martyr of God breathed his last. On the place where they discarded Orestes's body, a man bright as the sun appeared, gathered Orestes's relics, and carried them to a hill near the town of Tyana, honorably burying them there. This wonderful Saint appeared to St. Dimitri of Rostov after his repose, and showed him all the wounds on his body. In the year 1685, the author of this Life was preparing it to be printed at the Holy and Great Lavra of the Kiev Caves. One night, during the holy fast before the feast of the Nativity of Christ, when he had already completed this account, he fell asleep for a short while before the beginning of Matins and learned that the saint suffered still more torments than those described in his Life. 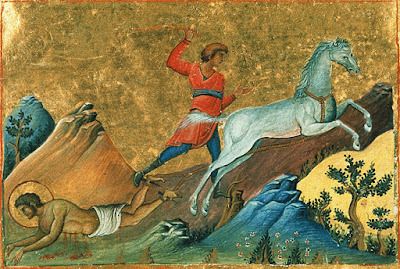 The Holy Martyr Orestes appeared to him in a dream, and looking upon him with joyful countenance, said, "I suffered more torments for Christ than these!" Then the martyr bared his breast and showed the author of his Life a great wound on his left side which penetrated to his bowels. He said, "Here they pierced me with a spear." The Saint also showed the wound at his right elbow, and said, "Here they cut off my arm!" The sinews in the wound had all been severed. Next he showed his left arm, which bore a similar wound at the same place, and said, "They cut off this arm here." After this he bent over, bared one leg, and showed a wound behind the knee, and then uncovered the other leg, which was wounded at the same place. He said, "My legs were cut off with a scythe." Having said this, the Martyr stood up, looked the writer in the face, and declared, "You now see that I suffered more torments for Christ than you described!" 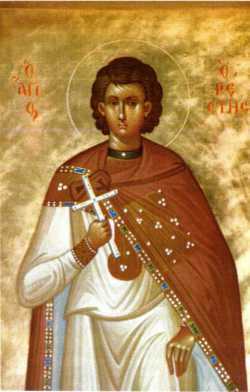 The writer began to wonder which Orestes the Saint was, and thought that perhaps he was the soldier Orestes, one of the Five Martyrs of Sebaste [celebrated December 13]. 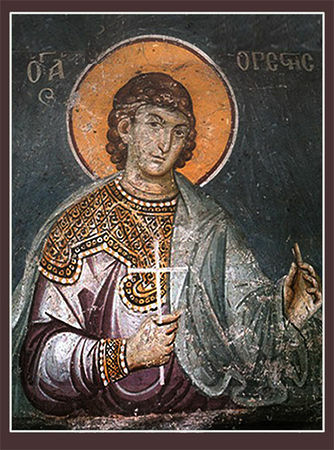 As if to answer his thought, the holy Martyr said, "I am not the Orestes who was one of the Five Martyrs, but he whose life you have just completed." With that, the bells rang for Matins, and the vision came to an end. Crucified on the Cross for mankind. Which was cooled by the dew of God's Spirit. And covered his whole body with wounds. That God had adopted him as a son. And be made worthy of Paradise with you. Thou didst confess Christ, O Trophy-bearer, and didst humble the idol-worshippers. Thou didst become a partaker of glory by undergoing the martyr's contest. We honour thee as a victor and cry to thee: Glory to Him Who has strengthened thee; glory to Him Who has crowned thee; glory to Him Who through thee works healings for all. 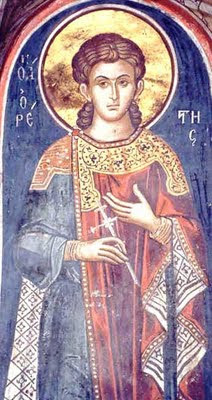 Thy victory in contest, O Martyr Orestes, was rewarded by Christ the Prize-bestower; He has granted thee the crown of life and divine power to work healings, for He is the Lover of mankind.